Build your dream bedroom oasis around our Amish Old English Mission Slat Bed. Featuring a beautiful straight post design, traditional slats and solid side rails, this gorgeous bed perfectly captures the essence of Mission style furniture. 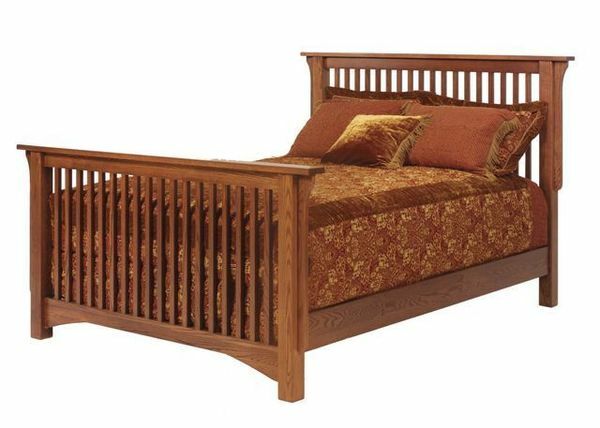 Crafted from some of the most beautiful hardwood in North America, the Old English Slat Bed is a solid bed that is made to an heirloom quality and sure to be handed down for generations. We offer our Miller Collection Beds in every size, from Twin to California King, so you can have the perfect bed, no matter what space you're furnishing! Once you've narrowed down the size for your new bed, pick the hardwood and stain combination that best suits your decor and add our optional three-drawer storage unit, where you can have the perfect place to keep your linens and bedding right where you need them! We offer stain samples for all of our beds, so you can narrow down your choices or match your existing furniture. Please call one of our experience Amish Furniture Specialists today with any questions at 1-866-272-6773 or to start your order by phone. Floor to Bottom of Side Rails Height: 9 1/2"
Floor to Top of Side Rails Height: 15 1/2"